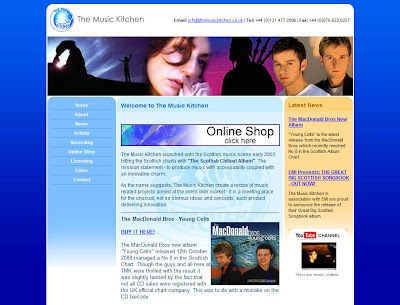 Having been introduced to The Edge by The MacDonald Bros of X Factor fame, The Music Kitchen had no hesitation asking us to develop an online store integrated with our Claymore Content Management system when it became time redevelop their website. These facilities along with a redesign of the website layout addressed the areas in which the old website was lacking and ensure the website can be maintained in house well into the future. Our Online Store software allows The Music Kitchen to sell their artist's abums world wide and have card payments authorised in real time. Claymore integration means all important content can be updated on demand with our easy to use Content Management system. Also integrated with the website is a YouTube Channel allowing music videos, sample tracks and TV adverts to be uploaded. Do Hotels Understand Their Credit Card Responsibilities? Over the past few weeks we've had a number of comments about online reservations companies providing Credit Card details complete with the CVV number to ensure that hotels can charge guests accounts for bookings made on their behalf. We've even had a couple of irate hoteliers suggesting that this number must be provided to them by their online booking service provider. It would appear that any number of their third party booking engines provide them with fax copies of this information to secure the booking. Whilst this has been going on for some time it is only a matter of time before someone gets their fingers very badly burnt. Hoteliers should check their merchant agreements; it will somewhere or another expressly forbid the storing of certain information. A Card Verification Value code, CVV, (CVV2 for Visa, CVC2 for MasterCard and CID for AMEX) is the (usually) three digit number located either on the front or back of a credit or debit card. Merchant’s can request the CVV code from card holders as another way to screen fraudulent transactions - increasingly, almost universally in the UK it is now necessary for "customer not present" transactions. The idea is that someone using a stolen credit card is less likely to have this code so they will be unable to complete the transaction. With most payment systems, you can adjust settings to automatically reject transactions where the CVV code does not match the card number. The effectiveness of this code is limited to the ability to keep it out of the hands of hackers and thief’s, which is why it is prohibited by PCI Standards from being stored. For merchants who charge customers on a recurring basis, the CVV code can be used with the initial transaction but cannot be stored for future transactions. The table summarises what is and isn't allowed and under PCI compliance the penalties are likely to be punitive. Can you really afford not to be able to take Credit and Debit cards from your clientele? Search any number of PCI (Payment Card Industry)compliance sites and check what is and isn't allowed; it is your repsonsibility and not knowing is going to be little comfort when the chargebacks start flowing in or the credit company unplugs your PDQ machine without any warning. Earlier this year ecommerce consultant Alex Bainbridge highlighted the issue in his blog pointing out that two well known hotel online travel agents (OTAs) were allegedly maintaining lax security on their customer credit card data. We've not mentioned the OTA's here but the full article is available to read here. The credit card details are transmitted (sometimes by fax) to the end hotel. The hotel can then use these credit card details in order to charge a customer in the event that they cancel or “no show” their reservation. The detail that is transmitted to the hotel contains all information required to charge a card, including the ID number found on the back of cards. So what is wrong with this? All companies that handle credit card information have to comply with the PCI (Payment Card Industry) credit card standards. Adherence to these standards isn’t voluntary - but mandatory. They are agreed by both Visa and Mastercard and are the industry standard. The last standard is an interesting one…. it seems to put the onus on the hotelier to adhere to PCI standards…. so perhaps this is what the hotel OTAs are relying on. Hoteliers and their service providers really need to take care to ensure that credit card security is taken seriously. A more recent and UK based article by the same ecommerce consultant Alex Bainbridge, highlights two further areas of breach. "PCI is a set of standards that define how you are permitted to hold and transmit credit card data. If anyone tells you their system is secure just because they have an SSL certificate they demonstrate that they don’t really understand how security works. PCI is much more than just an SSL certificate. Compliance is mandatory for any company handling credit card details (unless you decide not to handle credit card data - e.g. by using a 3rd party payment gateway). The first process has become “common” (or acknowledged to take place, at the least) by agents who have been banned from selling Ryanair flights. Instead of using the agency credit card the customer’s details are placed on the Ryanair website - making it difficult for Ryanair to see that the booking is an indirect booking. However, this process would require the agent to be PCI compliant (which they are unlikely to be, for this situation)….. The second process is common in the hotel industry. The card details are often transmitted to the hotel for charging. This would require the agent and the hotel to be PCI compliant. e.g. you can’t just “email” the card details to the hotel. Faxing is also problematic. The onus on the 3rd party. If you are a travel company that uses agents to send credit card data to you (on your behalf) then it is down to you to ensure your agents are PCI compliant. The above is something which our tourism bodies really should be taking seriously with e-commerce workshops being funded by Scottish Enterprise and Scottish Tourism Forum across the country should we not be ensuring that PCI is placed firmly at the core of this training. It is not enough to get business e-commerce ready; they must do it with best practice and legally. Is anyone grappling with the fact that much or the recommended e-commerce procedures being showcaseda re operating outwith PCI standards? It has become the norm and therefore no-one knows what to do about it - the result is nothing proactive happens." As Alex states in finishing "It will just have to take a “big breach event” to bring this to everyone’s attention." 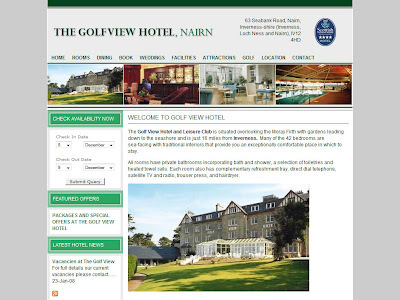 The hotel industry in Scotland need to recognise their responsibilities before one of the number is made an example of, and it will happen, sooner rather than later. Pebbles Spa near Girvan, Ayrshire have just updated their website to reflect a new range of treatments and to expand their market by offering products for sale online. 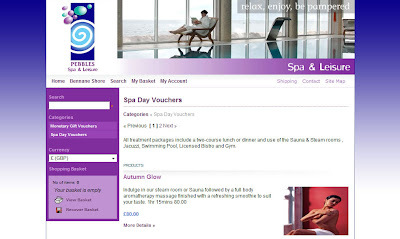 Pebbles chose to go live with their range of spa breaks and vouchers with a view to adding their full range of beauty and relaxation products at a later date. The existing Pebbles website was seamlessly integrated with our Claymore Content Management System which allows easy update of text, images and search engine keywords on the website. This allows the company to take control of their website and ensure it is up to date with weekly changes. In support of the website updates The Edge produced a number of updated brochure inserts allowing Pebbles to provide detailed and up to date information about the main products and services they wish to promote to enquiring customers. Other supporting work was carried out including the creation and management of Google Sitemaps which are submitted to Google for inclusion in their index. You can visit the Pebbles Spa and Leisure website at www.pebblesspa.com. 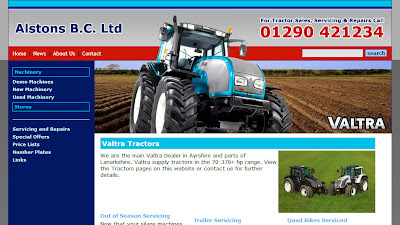 Alstons are the main Valtra Tractor dealer for Ayrshire and Lanarkshire and their agicultural engineering business also provides maintenance and repair, used equipment sales and stores. We advised installing our online store software and enabling the special catalogue mode which turns off the shopping cart and online purchase features. This solution allows Alstons to use the software's extensive content management capabilities and search engine promotion features and in the future simply enable the built in shopping cart to take orders with live online payments. The news system is powered by Google Blogger which as well as integrating seamlessly into the website provides significant search engine benefits. Other Web 2.0 website features include submission to Google Base and Google Local. You can visit the Alstons BC website at www.alstonsbc.co.uk.